"Student A", between June and August, reads for roughly 20 minutes each day. This includes text they may come across at day camps or vacations. At the end of their summer they have amassed nearly 1,400 minutes of reading. Students like "Student A", actually grow in reading levels throughout the summer and come back to school as better readers than when they left due to the ongoing practice they participated in at home. "Student B", in the same three months, reads on and off for less than 20 minutes each day. They, for various reasons, may not come across different types of text from camps, vacations or other opportunities. "Student B"'s total minutes for the summer may end up around 500-800, leaving them roughly in the same place academically when they come back to school as they were when they left in the spring. "Student C", doesn't read much at all over the summer months. They encounter some text here and there but they make no real effort to read a book or magazine throughout their summer break. Student's like "Student C" actually fall back during the summer, losing some of their ability to read fluently and on grade level. When students like "Student C" come back to school in the fall, they can be up to three months behind their peers, requiring extra efforts to get them caught up. This extra time means missing other instruction, putting them in a situation where keeping up with their peers is an uphill battle. 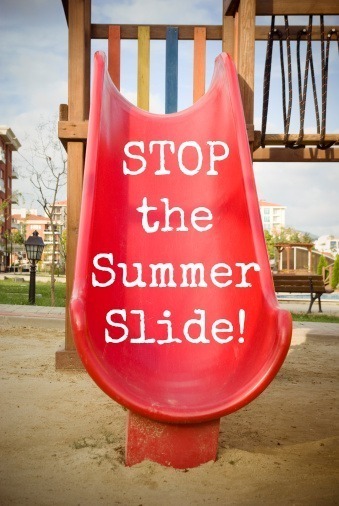 Schoolcraft Elementary School is proud to partner with the Schoolcraft Public Library to prevent "Summer Slide". The school encourages all families to participate in the fun, engaging summer programming and to visit Mrs. Faye at the public library to ensure that students have interesting and appropriate books at home all summer long to ensure that they are set up for success when returning in to school in the Fall.